This next issue of SUPER-TEAM FAMILY I bought while on a trip to a more distant supermarket than the one my family typically frequented. 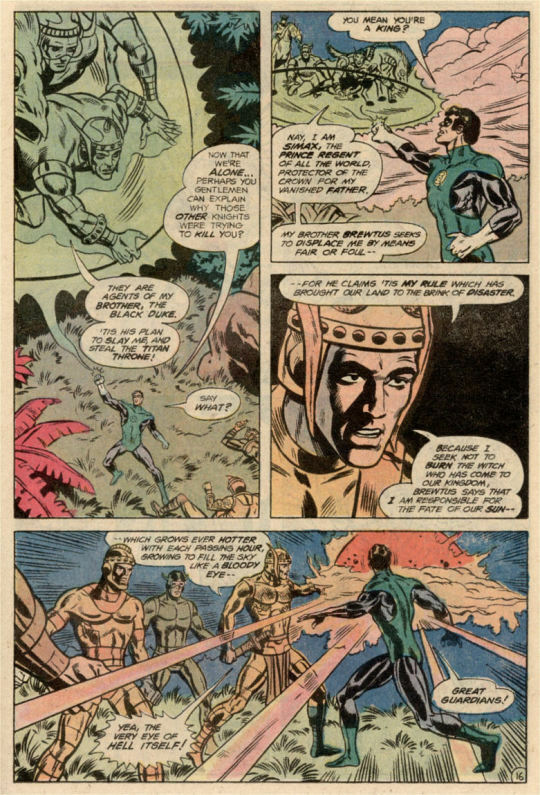 it was the second part of the “Atom’s Quest” serial, a four-part story that owed a bit of its style to the Marvel approach of the era–writer Gerry Conway had been trying to incorporate such elements into the assorted titles he’d been writing and editing. 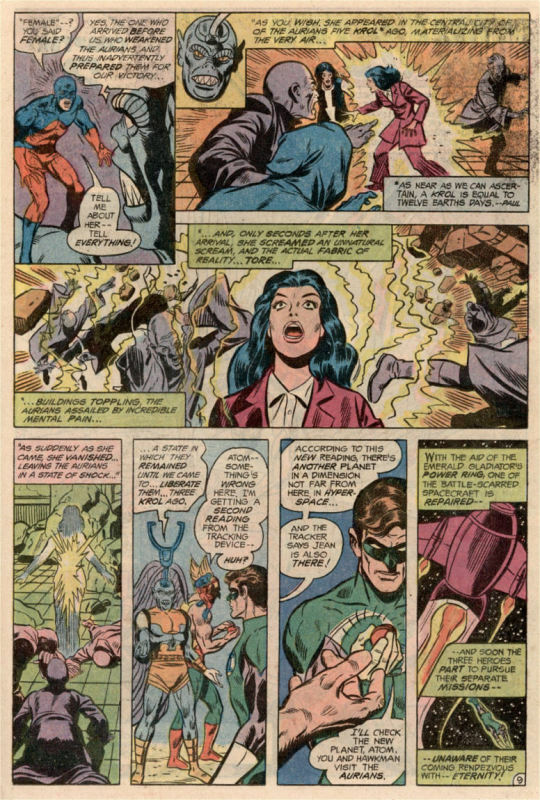 And this story, which would run through four team-ups with other characters, used the whole of the nascent DC Universe in a manner that wasn’t typical in 1977. This issue’s story picks up some time after the previous installment left off, with Green Lantern, Hawkman and the Atom running across a planet under siege and moving in to attack the aggressors. 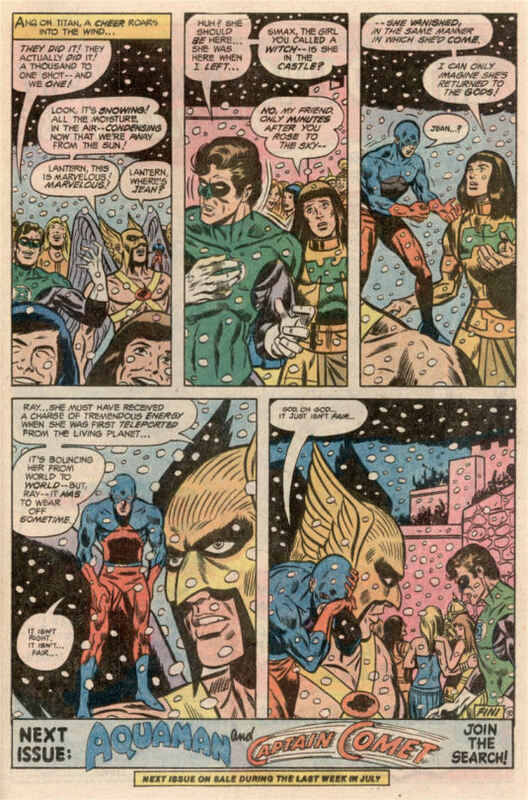 In flashback, we learn that, after Jean Loring had been teleported away to somewhere at the end of the previous part, the Atom was able to devise a tracking device to locate her, and solicited the help of his frequent ally Hawkman in tracking er down. Green lantern also happened to be on the JLA satellite when the Atom appeared to make his request, so he joined in as well. Beating back the invaders, the heroes learn that they’re representatives of Dhrune, a conqueror race, and that they’re taking advantage of the fact that the Aurians on the planet below have been thrown into a state of stupor by the sudden appearance of Jean Loring and a sonic cry that she gave out. Following this, the Atom’s tracker reveals that Jean seems to also be on another nearby planet as well. So our heroes divide their forces. Hawkman and the Atom descend to Auria, running almost immediately into further enemy Dhrune attackers. The Atom is fighting like a crazy person to get to Jean, causing his friend Katar to worry about his mental state. But Hawkman maybe should have worried as much about himself, as eventually both heroes are brought down. 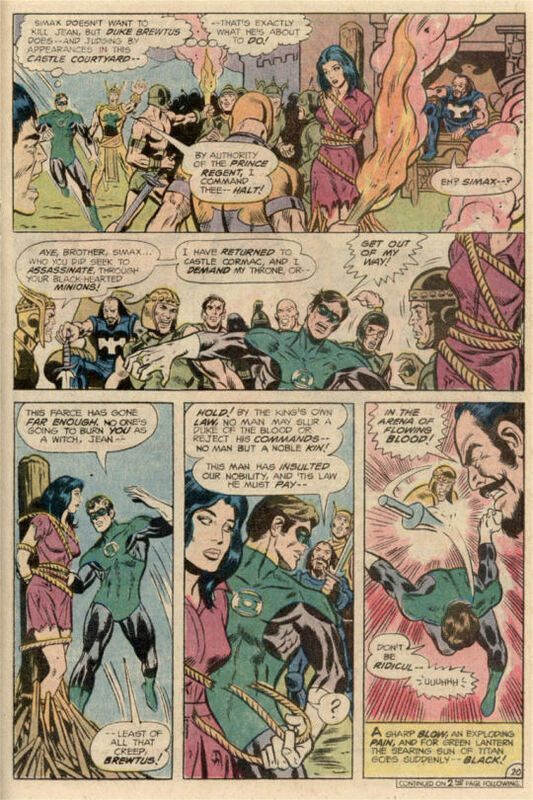 meanwhile, Green Lantern has journeyed through the dimensions to the other planet, a quasi-medieval world whose people are also entwined in combat. The Lantern winds up saving Prince Simax, whose brother Brewtus, the Black Duke, is looking to put out of the way so that he can have the throne of the realm. On Auria, Hawkman and the Atom awaken to find themselves prisoners.They learn that the Aurians possess the power of mind over matter, and that the Dhrung are siphoning this gift away from them to use for their own. The Atom shrinks small enough to escape his shackles and attempting to engineer Hawkman’s escape by traversing a tiny river stream. 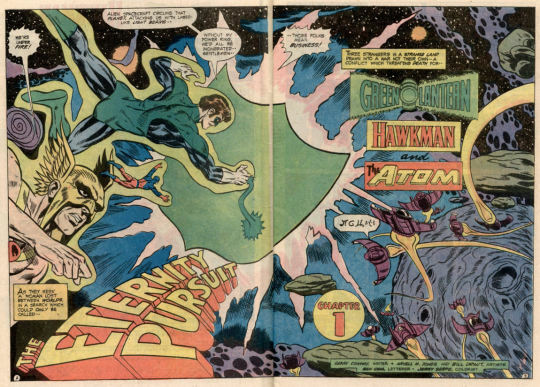 Meanwhile, Green Lantern has learned that the planet he’s on, Titan, is rapidly slipping its orbit and falling towards its sun, and that Jean Loring is somehow responsible. Brewtus is about to burn Jean at the stake when GL intervenes–but the dope is clocked from behind by a lance and rendered unconscious. Klutz! The Atom is able to make his way through the electrified grill placed over teh entranceway of the tiny river by reducing himself to sub-atomic size, and so he goes about securing Hawkman’s release. 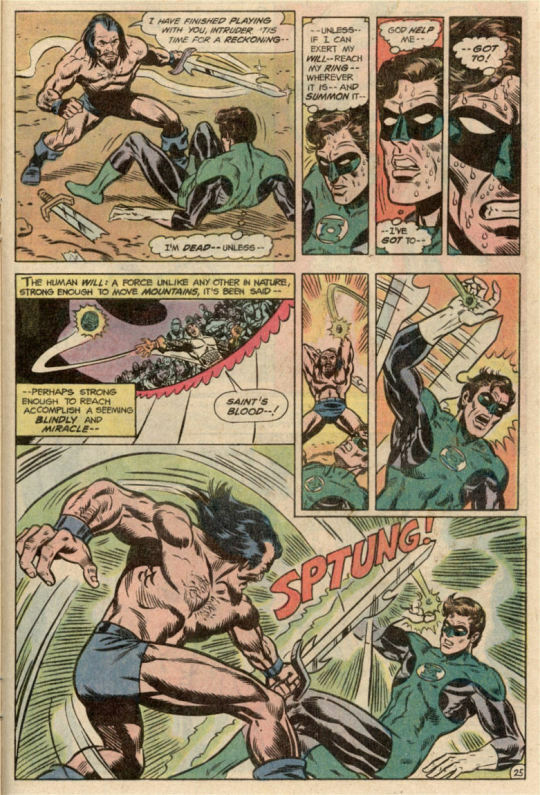 Meanwhile, Green Lantern comes to, his Power Ring having been removed (which ought to be impossible, but we’ll overlook that for the moment) and forced to fight Brewtus in the Arena. Hal gives a decent account of himself, but he’s no match for the stronger Brewtus–unless he can summon his ring to him from a distance–which he does! The three heroes reunite to discuss their twin problems. The Aurians’ mind over matter powers only work when they’re in contact with the ground. 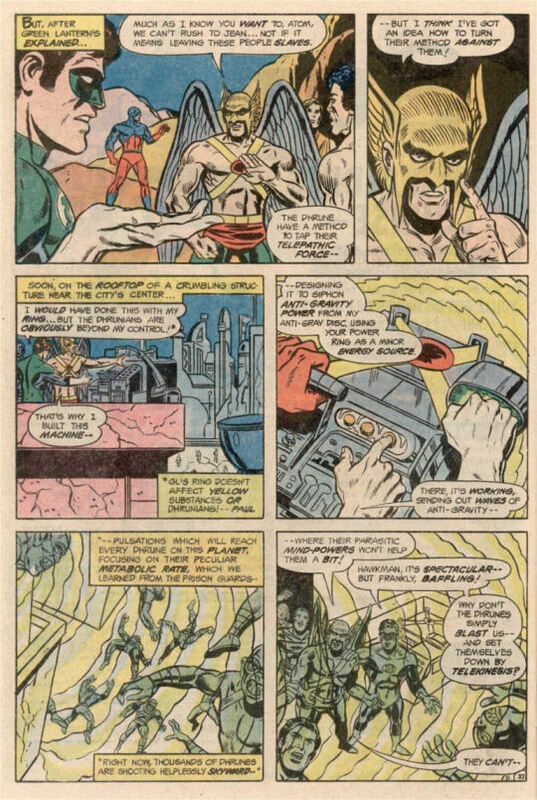 So Hawkman bodges together a device from his Anti-Gravity Nth Metal that is powered by GL’s ring, one which hurls all of the invading Dhrungian soldiers skywards, where their siphoned abilities are of no use to them. But Auria itself is a world on the brink of ecological disaster. Its people need a new home–And GL has an idea on that score. Green Lantern relocates the Aurians to Titan, which seems to allow them the same mind over matter abilities when they’re in contact with its surface. The Aurians combine their mental powers to literally push planet Titan away from its sun, settling it back into its original orbit. And so, the day is saved! But while that saving was going on, the still-insensate Jean teleported away again, to who-knows-where? And so, the Atom’s quest would continue in the following issue. 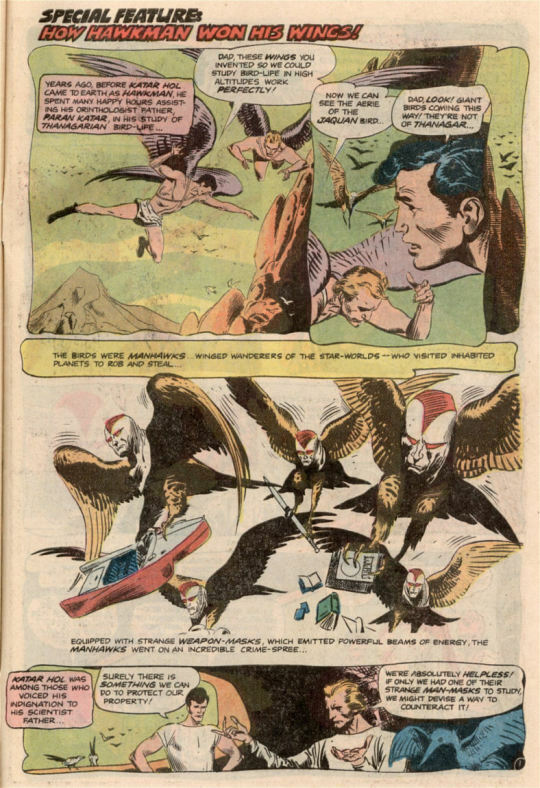 The issue also included a three-page filler-feature, cribbed from one of Hawkman’s BRAVE AND THE BOLD tryout issues several years earlier, concerning the origins of the special headgear worn by Thanagarian police officers such as himself. It’s a choppy little piece, but the vintage Joe Kubert artwork was nice.